I am completely addicted to Instagram. I promised myself I would never post any photos on this blog that weren't taken with my DSLR, but since I have barely touched it in weeks, I thought the least I could do for you was to show the photos I have taken, even if they are iPhone photos. I hope to have a real photo post for you later this week, though. Jag har totalt fastnat i Instagram. Jag lovade mig själv att aldrig blogga några bilder som inte var tagna med min stora kamera, men eftersom jag knappt rört den på flera veckor har jag inget annat att visa. Förhoppningsvis kommer ett ordentligt fotoinlägg senare i veckan. i keep telling my boyfriend he needs to let me use his phone, and then trying to install instagram so i can use it....but his phone is password protected. SIGH. när mobilbilder är såhär fina gör det iiingenting. not gonna lie, instagram IS pretty amazing! lovely snapshots though! such a bright colors! I love instagram. these photos are so summery and warm I love the clothes pins. ahhhh I love that you tried to not post iphone photos. I get sick of them all too quickly, but only when they're crappy. These ones...these ones are great. Especially the chairs and the sandals. What a great selection. They all just scream summer to me in the most delightful way. 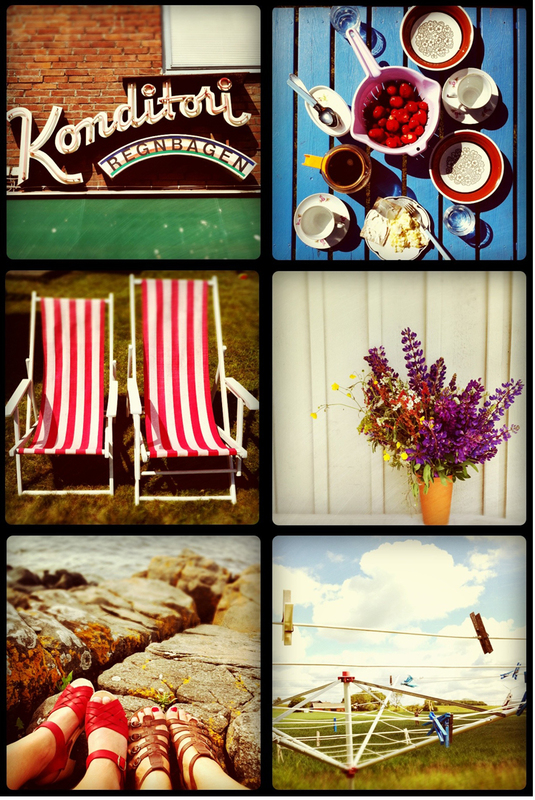 I kept seeing people mention Instagram and your post of lovely pics made me download it and now I am addicted! And I am following you on there too now so keep up the good work! I just found you on Instagram so I could follow your work! I just came here for the first time and I have to say: What a wonderful blog. I think I'm going to stay :)! hehe vet vad du menar, jag tänkte samma sak - men sedan gick det inte att låta bli! så länge man har kul så :) ha en fin söndag! It's the photographer that counts, not that camera - these shots are lovely! And I can totally sympathize with you, Instagram is really additive! Those are great iphone photos! well even if its not with a dslr, you can't fake having a good eye. these are wonderful! i like the instagram shots but i really miss your dslr ones.